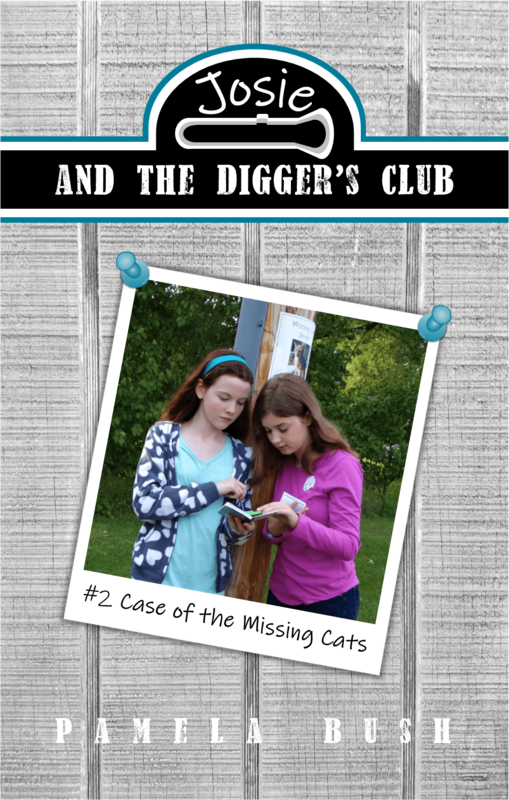 The Digger’s Club members: Josie, Charlie, Lily, and Amy, are plunged right into another case involving missing cats! The first Missing Cat poster catches their attention. Just days later, when the third cat is reported missing from their city of Paradise Wisconsin – the Diggers get involved. Can the cats be rescued? Can the real cat-nabber be caught before someone gets seriously hurt? Join Josie and the Digger’s Club as they solve their new adventure of the Case of the Missing Cats. Josie, Charlie, Lily, and Amy are knee deep exploring an old, supposedly haunted stone mansion – one recently inherited by Amy’s family who plan to remodel it into a bed and breakfast. The DIGGER’S CLUB stumbles onto a clue, which leads to another, and another, and their first adventure begins! Hope Montgomery’s life is crashing around her and she blames God. Pierce Matthew loses his wife in childbirth, gives the baby away, and blames God. Their paths cross – friction flies. Sydney Larsen is caught in an embezzlement scheme and her partner is murdered. Can Lt. Quaid Williams and his team discover the murderer’s identity while keeping Sydney safe? Abigail Turner, aka Sydney Larsen, and Quaid are dating, but things aren’t running smooth. Frustrated, Abigail befriends a beggar, who in reality is seeking revenge against Lt. Quaid Williams. His plan? Kidnap Quaid’s girlfriend. Rose Woeberg is on the run . . . and she has no one to turn to! Out of the Heart – revenge formulated a plan in her head. Rose Woeberg is done running and is calling Petoskey, Michigan – home. could send him to prison for life. He wants it back and will go to any lengths to accomplish that. Elizabeth Warner stared at an old photo of her husband. “I wish I’d known you back then,” she sighed. Suddenly, a terrible auto accident catapults her into the photo. If you’re looking for entertaining fiction that ranges from drama to suspense, you’re at the right place! Pam’s novels will keep you reading to the end; sometimes you’ll laugh, sometimes you’ll cry, and sometimes you’ll realize that principles learned can be applied to your own life. Have fun exploring the site and come back regularly for updates. You can also join us on Facebook or follow Pam on LinkedIn or Twitter. Read a sample from "Out Of The Whirlwind"
Out of the Snare is one of those rare books you simply cannot put down; even if that means at 2:00 in the morning! Personally, I feel this thriller is written with the sme finesse and level of professionalism as any novel put out by Dee Henderson. Stimulating and exciting, this is one fantastic read! !” – Rhonda E.
Pam, since the end of Oct. 2013 – April 2014 I’ve read your books . . . twice! All four of them? Yes . . . and they’re just as exciting and interesting the second time around! – Sue E.
Out of the Mire starts out like a harlequin, but soon picks up. I couldn’t put it down. In fact, I stayed up until 12:30 p.m. to finish it – which is late for me! – Della B. Out of the Mire is hard to put down. This is my favorite one of trilogy. – Doug B. Out of the Whirlwind and Out of the Snare could be called a series but each book is unquestionably complete on its own. They are both what I would call, heartfelt first-class Christian fiction reading. Whether we like it or not, we all will deal with the loss of love ones at some time in our life. In “Out of the Whirlwind” Pamela strikes home as she addresses real life feelings of anger, and grief, and yes, even the way we mourn those who have left us behind. My favorite character Hope; is so real that I wanted to meet her in person. Both of these well written books remind us that we never really know just what’s inside another’s heart. But when troubles come we learn that our Lord and Savior will never fail us. “You are a gifted writer. He has blessed you with compassion, insight, knowledge, and wisdom on how to apply it all.” – Emma K.
“I started reading Out of the Whirlwind and didn’t stop until I read it cover to cover. I’ve shared this book with several friends. We all want to read more, so I plan to buy the other two books.” – Sheryl T.
“I’ve been wanting to purchase Out of the Snare, but it hasn’t worked out;then I went to my Mom’s and she had one sitting on the table. A friend had loaned it to her. I started reading it and couldn’t put it down! Could I possibly purchase some signed copies from you for gifts?” – Deb H.
I’m reading it for the second time and am actually enjoying it even more! – Patty N.